In Andergast, King Efferdan and his notoriously superstitious suspects await a state visit from high-ranking dignitaries. For centuries the kingdom has been at odds with neighboring Nostria, but now first steps are being undertaken toward a lasting peace. But a plague of crows troubles the king, for the birds are acting with unusual aggressiveness, even attacking humans. Moreover, there are those among the citizens of Andergast who swear that the crows are bringing them dark nightmares. As the belligerent creatures infiltrate even the castle itself, the king seeks a skilled bird catcher - an opportunity for young Geron to prove that the reputation for ill luck that has followed him since childhood is undeserved. 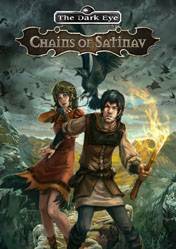 There are no comments yet about The Dark Eye: Chains of Satinav . You can be the first one!